Introduced by Santa Claus himself, kids will be thrilled to hear their name repeated throughout this stunning compilation of Christmas stories and songs. It really is the most magical time of the year and children's faces will light up with glee as they sing along or listen to the Christmas tales. Children’s faces will light up when they hear their name repeated throughout this compilation of the best nursery rhymes and stories ever. His or her name will be mentioned 15 times in total as they are encouraged to sing along. Children’s faces will light up when they hear their name repeated throughout this compilation of the best nursery rhymes and stories ever. His or her name will be mentioned 15 times in total as they are encouraged to sing along. 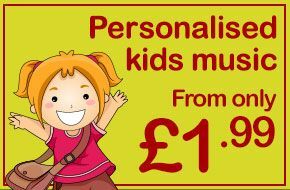 Ideal for children up to 7 years old, this CD will become a favourite for children; at bedtime, in the car, or just for daytime entertainment.